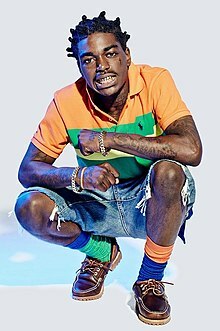 Bill K. Kapri (born Dieuson Octave; June 11, 1997), better known by his stage name Kodak Black, is an American rapper, singer and songwriter. He is noted for his singles "Zeze", "Roll in Peace", "Tunnel Vision", and "No Flockin", as well as his numerous legal issues. Late on April 24, 2019, while on tour for his most recent album, Dying to Live, and while performing at a venue, officials from the Federal Bureau of Investigation and Metropolitan police entered and searched one of Kodak's tour buses that was parked at the venue. While Kodak was not in the vehicle at the time, the FBI founded weapons in the vehicle and detained a few of Kodak's crew members. Allegedly, the FBI attempted to enter the club in which Kodak was performing, but denied entry by the owner. TMZ stated it was "unclear" whether or not the bus was actually owned by Kodak. This came a week after his arrest at the US-Canada border. It was stated Kodak himself did not get in trouble with law enforcement. ^ Shifferaw, Abel. "FBI Raided Kodak Black's Tour Buses While Rapper Was Performing in Washington D.C." complex.com. Complex. Retrieved 25 April 2019. ^ Centeno, Tony. "BUS OUTSIDE KODAK BLACK SHOW RAIDED BY FBI: REPORT". xxxlmag.com. XXL Magazine. Retrieved 25 April 2019. This page was last edited on 25 April 2019, at 15:04 (UTC).